I don’t know about you but I think at this point I am fully addicted to simple, delicious freezer meals. Even my husband, who first balked at the idea of freezer cooking and insisted he wouldn’t like any of the meals, has whole-heartedly embraced this freezer friendly lifestyle. It has not only saved us a ton of time and stress, but a ton of money as well. Now that fall is upon us and school is in full swing, I love serving down-home comfort-food type meals, especially those that can be thrown in the slow cooker for a completely effortless meal. 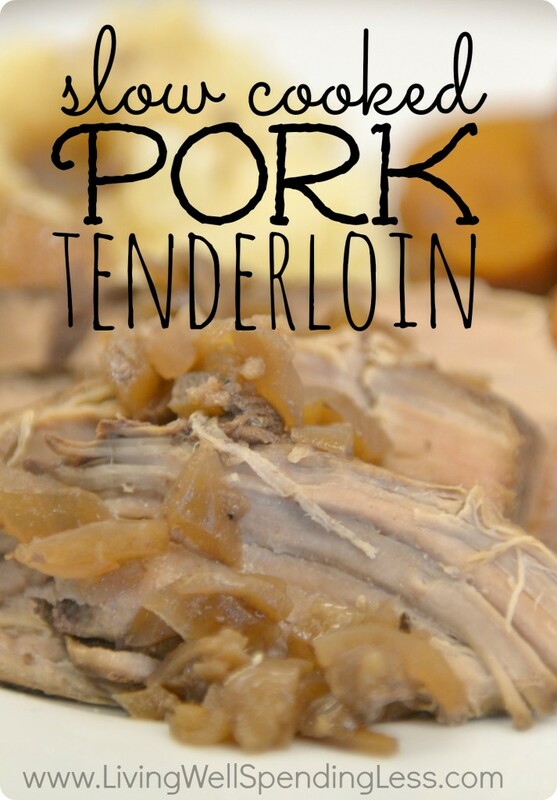 This slow-cooked pork “tenderloin” is a great alternative to beef or chicken and comes together in just minutes. 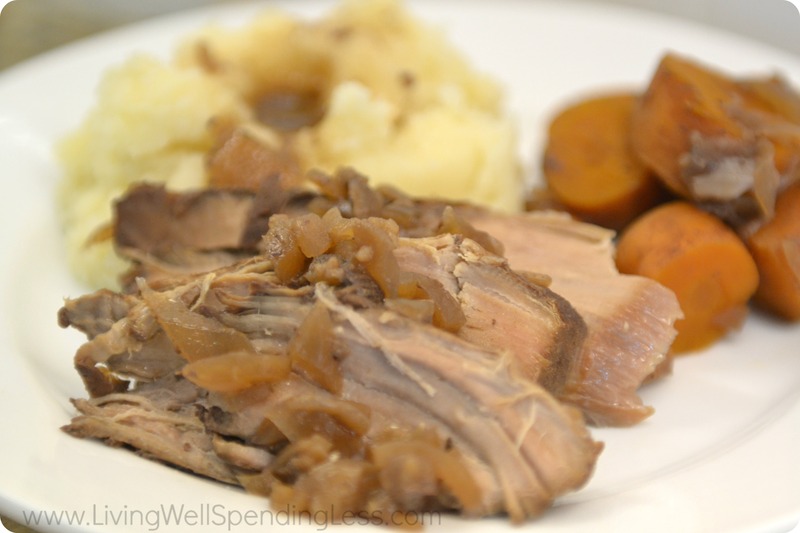 (It is technically a pork loin roast, which lends itself better to slow cooking!) It can also be frozen ahead as part of a freezer cooking day! The recipe below makes two roasts, so if you only want one be sure to cut the ingredients in half. 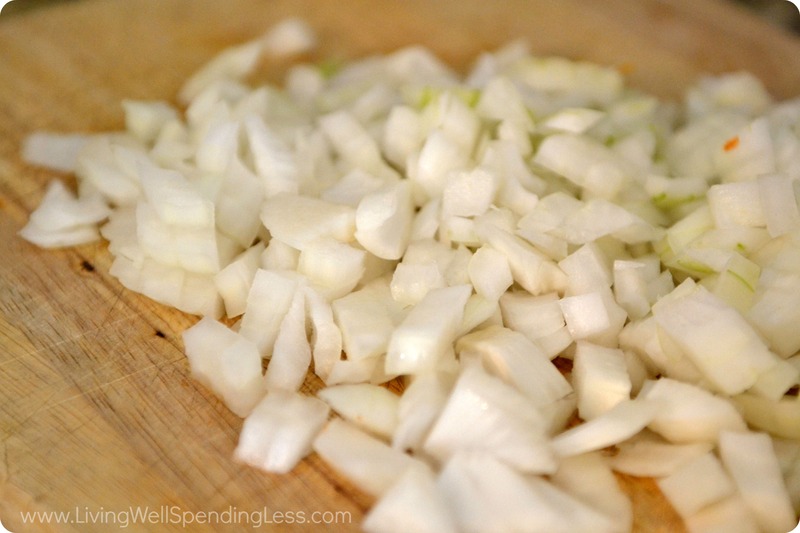 Step 1: Chop onion and mince garlic. 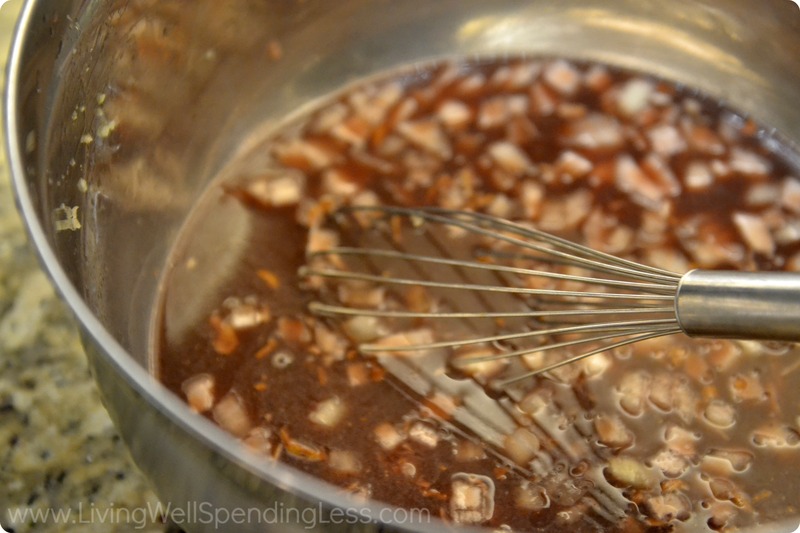 Step 2: Whisk together soup mix, chicken broth, wine, soy sauce, Worcestershire sauce, onion, garlic and black pepper. Step 3: Label bags; place one 2 lb pork tenderloin in each bag and divide marinade evenly among bags. Then freeze. Step 4: Thaw meat; add carrots and potatoes and cook in crock pot on low for 4-5 hours. Full of flavor, tender and no oven required. This recipe is sure to be a winner! 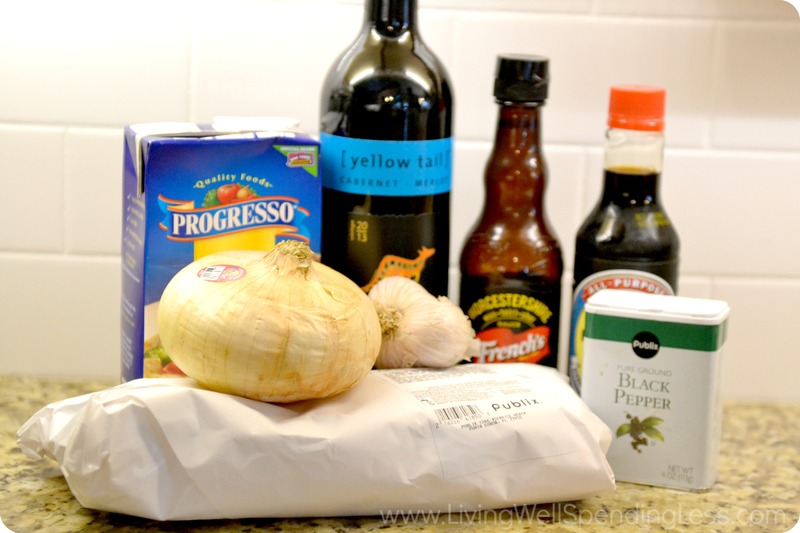 Whisk together soup mix, chicken broth, wine, soy sauce, Worcestershire Sauce, onion, garlic and black pepper. 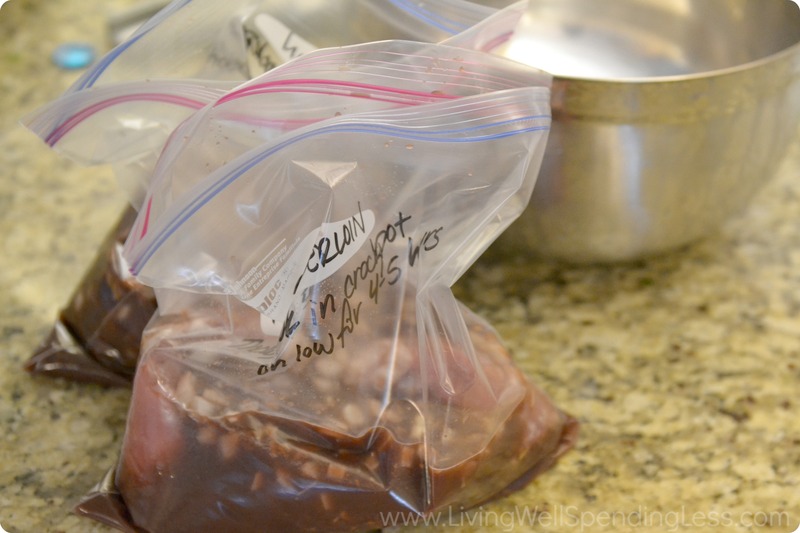 Label bags; place one 2 lb pork tenderloin in each bag and divide marinade evenly among bags. Then freeze. Thaw meat; cook in crock pot on low for 4-5 hours. Preparation time: 5-7 minutes. Cooking time: 4-5 hours in crock pot. Number of servings (yield): 6 for 2 lbs of meat. What are your favorite freezer friendly meals? I love cooking pork in a Crock Pot. It is so easy and turns out so good and tender every time. I must admit I have not fully embraced freezer cooking though. Part of that is because we don’t have a lot of freezer space. We just have a standard fridge with freezer and don’t have an extra deep freezer. I figure prepping everything for the Crock Pot is easy enough that I would rather fix it for dinner tonight rather than a few weeks from now. Although I do like that this recipe makes 2 meals so I could do 1 tonight and freeze the other for later, virtually eliminating the prep time for the next time we eat it. It is definitely tough when you don’t have a lot of extra freezer space, but cooking one right away and freezing the other is a great solution! Looks delightful! I shall bookmark it for when Pork Loin Roasts go on sale. 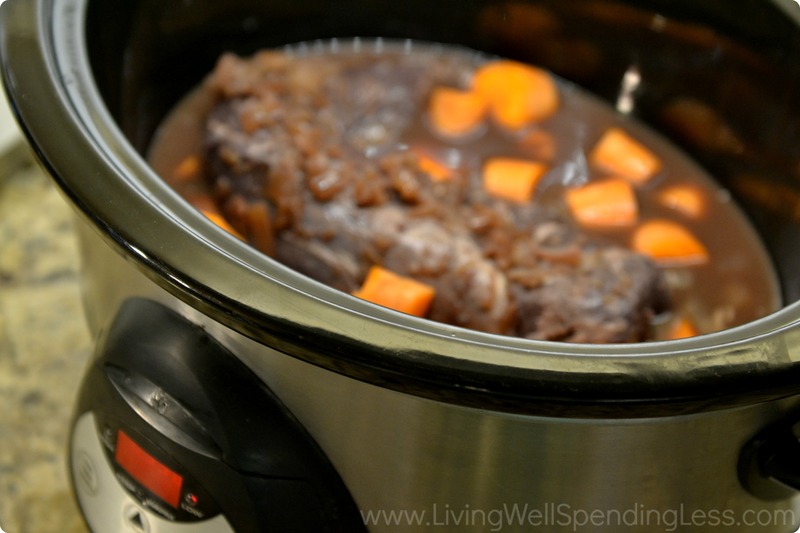 Thank you for sharing – I love crock pot cooking. mmmmmmm looks yummy! Thanks for sharing! I’m totally a crock pot girl! I’m guessing you put the meat AND the marinade in the crock pot, but the instructions don’t say. I wouldn’t want to end up with soup if it was meant to be the meat only! Thanks, that was what I was wondering too! What could you use in place of the wine? I substitute cup-for-cup with broth plus I like to add 1 tbsp. of red wine vinegar (for beef) or white wine vinegar (for chicken/pork) for every cup of wine called for in the recipe. It really perks up the sauce! Can I cook this frozen in the crockpot instead of letting thaw? I work and it will have to be in the crockpot 8 hours. This was by far the best tenderloin recipe I’ve had. I didnt have wine so omitted it and used a seasoning pack for beef stew. So good! 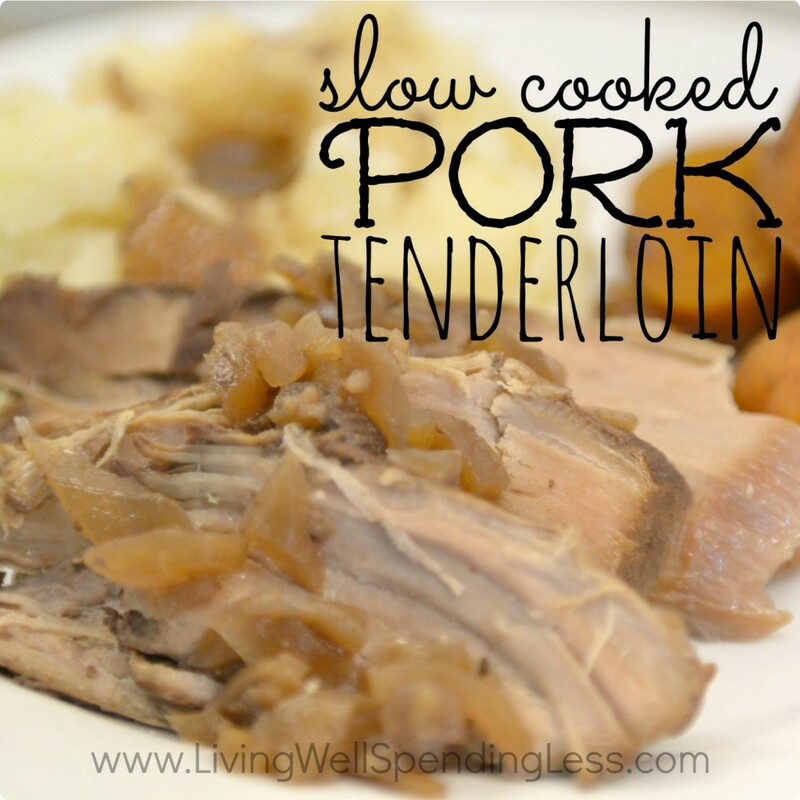 For 1/2 of the recipe how much carrots and potatoes would you add to the crockpot when cooking the pork? Just a suggestion, but.. Make any required meats the LAST thing you put in your freezer bags. That way, they will be the first thing out and rest on the bottom of your crock pot. Are the nutritional values for your recipes available? Oh my goodness! I made these this week and they were amazing! So flavorful but not overpowering. The meat was so tender, too. We eat a lot of pork and I have been looking for different ways to cook it. So glad I found this recipe!